Happy Meat Free Monday! I have been REALLY busy lately, attending lots of fabulous events, but that doesn't mean I haven't been spending time in my kitchen, eating out at new spots, or shopping at the farmer's markets. I'd rather be outdoors and enjoying summer in Chicago than sitting in front of my computer. Make this salad for a light lunch/dinner or serve it as a side dish at your BBQ. Orzo is my favorite pasta to use in pasta salads because it is not as heavy as other pastas. This salad is simple, fresh, and healthy. Cook the orzo according to the directions on the package. 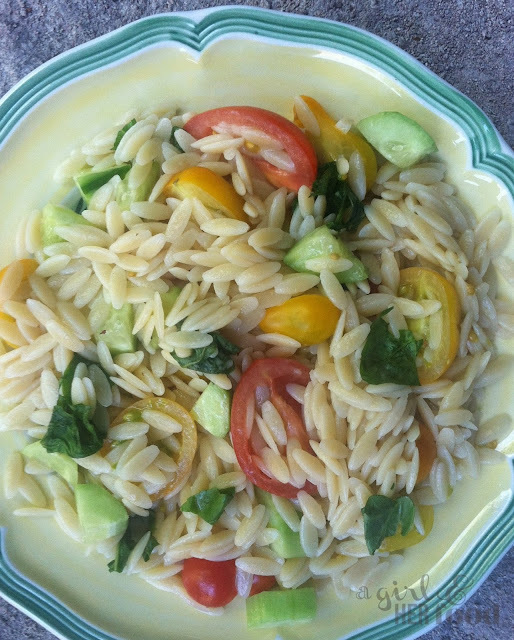 Set aside and let the Orzo cool. In a bowl, add cucumbers, tomatoes, basil and drizzle the vinaigrette to cover the salad. Toss well. Season to taste with fresh ground pepper and salt. Serve chilled.